Toyota trucks have always had an excellent and well-earned reputation for reliability and toughness. However, they have consistently ignored a market segment that is near and dear to the American truck buyer’s heart…the big truck. The U.S. companies have always understood this. Ford has been number one in the truck market for years with their F-150 because they understand that we like our trucks big and powerful. Even when Toyota stepped up to the big-truck market with its first generation Tundra, it wasn’t really a “BIG TRUCK.” Well, Toyota has definitely stepped up to the plate in a big way with its newest Tundra. This thing is big in every meaning of the word…and it also packs a few pleasant surprises (did I mention that this truck is big?). 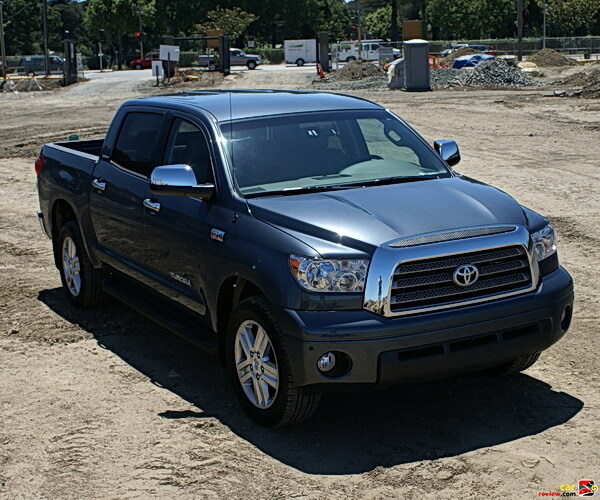 I tested a 2007 Toyota Tundra Crew Cab Limited. The Crew Cab comes standard with a short bed and four full-sized doors. Toyota has really beefed up the options list, and it’s possible to order this latest Tundra in an amazing variety of configurations. This particular vehicle came equipped with the 5.7 liter V8 that produces an astounding 381 horsepower at 5600 rpm and 401 pound-feet of torque at 3600 rpm. I feel that I should be using capital letters or exclamation marks when listing those figures, because those are truly big numbers! The motor is mated to a smooth shifting, six-speed automatic transmission. Our model was the two-wheel drive version with 20” five-spoke, aluminum rims wrapped in P275/55R20 Bridgestone Dueler tires. The exterior of the vehicle revealed no unpleasant surprises. The exterior panels are solid and align properly. Panel gaps are uniform and even. The tailgate operates on pneumatic springs, just unlatch the gate and allow it to slowly lower to a fully open position. No crude tailgate slams with this truck. The engine compartment is no show piece, but it is well laid-out and all of the important parts look reachable. Do-it-yourselfers should feel right at home. There is one minor fly in the Tundra ointment, the doors exhibited a little rattle and don’t have that vault-door feel when closed. I would like to point out that this was only noticeable when closing the doors. This truck was extremely tight when on the road. The attractive, tri-color interior is finished in leather and high-quality plastics.The design is very modern and leaps beyond the first generation Tundra.The seats are fully adjustable, heated, and very comfortable.The instrument cluster and gauges are well organized and easily readable behind a four-spoke steering wheel.There are an amazing variety of compartments and storage bins in the cabin of this truck.You could hide a Chihuahua in the center console…and there’s even a pen holder!Toyota equipped this truck with about a dozen cup holders and two sunshades each for the driver and front seat passenger (one for the side window and one for the front).The vanity mirrors have dimmer switches.The rear window electrically retracts into the cab at the touch of a button.The options in Toyota’s top-of-the-line Tundra go on and on. Toyota did not ignore the rear seat passengers either.There is a fold down center console (with two cup holders) in the 60/40 split seat.Both sides recline independently.I moved the front seat to the full rear position and still had more leg room than some luxury cars.There are two vents mounted in the front center console that are within easy reach of the rear seat passengers.Entry and exit is a snap for front and rear passengers through very large doors.I would recommend that anyone purchasing this truck opt for the step boards.This is a very tall vehicle and might prove difficult to enter and exit for those of us who are a little less limber. When under way, this is a very quiet truck.Wind noise is almost non-existent.There are no rattles or squeaks.Toyota did a good job putting this truck together and everything fits.It’s very easy to speak to a passenger using a normal conversational tone.Even the oversized mirrors don’t contribute any significant noise to the driving experience. Ride quality is stiff.While this truck glides over the small imperfections in the road, you will feel medium and large bumps.My first generation Tundra has a much smoother ride and in my opinion would make the better commuter.But this Tundra is quieter and has an amazing 10,400 pound towing capacity.If you consider the towing and hauling capacity of this truck, the ride is very reasonable. Toyota has a truly stellar motor here.The transmission is no dog either.The horsepower and torque make for effortless acceleration under any condition.This truck gets under way without any drama.Press the gas pedal and you are pushed back in the seats.The numbers on the speedometer climb at a steady and satisfying rate.No vibrations, no crude noises, just smooth, effortless power that gets you up to speed faster than any 5300 pound object has a right to.Toyota is claiming around 20 mpg on the highway.We all know that the current mpg rating system is broke, but even if you could get 17-18 mpg on the highway, it would be an amazing accomplishment considering the output of this motor coupled with the weight of this vehicle. Editor’s note 2: view the Tundra spec sheet for full specifications, including the observed gas mileage recorded after a full day of testing and 200 miles. Let’s not forget that this is a truck, and a pretty heavy one at that (remember the 5300 curb weight).However, it handles pretty well (for a truck).I drove through some canyon roads and the Toyota never became unsettled.There was no unseemly side-to-side swaying and it went in the direction I pointed it.Once again, I would like to point out that you can feel medium to big bumps, but it’s reasonable considering this truck’s capabilities. Braking is very good in this vehicle.13.9” discs front and 13.6 discs rear makes for some serious stopping power.Toyota’s commitment to a serious towing vehicle is most evident when you look at this braking system.No one towing 10,000 of cargo down a steep and windy road wants to find out that they are under-braked.I don’t think you have to worry about that in this truck.Stops (with no load) were linear and effortless. Toyota wanted you to realize that this is a full-sized pickup and this is clearly illustrated in the design. I parked this latest Tundra next to my first generation Tundra. The new Tundra truly dwarfs the old. It’s bigger in every way. The fenders aggressively flare. The cab is wider and taller. The front end would easily fit on a semi-tractor. The jury is still out for me as far as looks are concerned. Initially, I didn’t like the styling. However, it has started to grow on me although I think Toyota tried a little too hard. Value is a very subjective category. If you use this truck for its intended purpose (hauling and towing) and it proves reliable, then it could be a good value. However, $40,000 is a lot of money for any car, much less a truck. You could opt for the SR5 with the same motor and transmission for around $8,000 less, but then you would have to give up some of the great bells and whistles I talked about earlier. Personally, I don’t need those bells and whistles and would be satisfied with the SR5.And for $8,000 less, I could easily say that this truck is a great value. This is a solid, well-built truck that would have earned a 9 in the build category, but rattle when closing the doors drops the mark to an 4. A thoughtful, comfortable, option-filled interior earns this vehicle 5 points in this category. Outlandish horsepower and torque, amazing tow and hauling capacities, plus smooth, seamless acceleration earn this vehicle the first 5 that I have ever given for performance. Decent handling but a somewhat bumpy ride, 3 points for handling…wait, can’t forget those great brakes, 3.5 points. I know what Toyota is trying to say with the styling, but I think they are trying too hard, 3.5 points. Even though it faces a lot of competition in its market, I think that it’s a very good value (a much better value at the SR5 level), 4.5 points. Is this a good truck? No…it’s a great truck.Toyota has not only made its presence known in the big truck market with this Tundra, they have raised the bar.If I were in the market for a full-sized pickup, this would be the choice for me (just make mine a SR5). Editor’s Note: Cars similar in class to the Tundra are the Honda Ridgeline, Nissan Titan, Ford F-series, Dodge Ram 1500 and GMC Sierra Classic 1500, and Chevrolet Silverado Classic 1500. An appreciative thank-you goes to Stevens Creek Toyota for graciously providing the Tundra demo truck. This review would not have been possible without their unconditional support and help.